The market of nonwovens for hygiene use is continuously expanding. 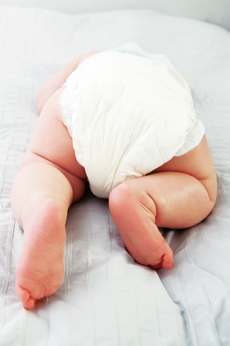 New construction concepts for baby diapers, incontinence products as well as female hygiene products are focussed on better wearing comfort – normally thinner materials with the same good absorption and retention capacity of body fluids. To support a good skin sensation, our hydrophilic spin finishes can also contain plant extracts such as aloe vera or avocado oil. The treatment of hygiene articles is based on the well proven tradition with DURON OF 4012 and DURON OF 1547 which are both certified at the leading producers of hygiene articles. The raw materials of DURON SL 4069 have been carefully selected and comply with FDA as well as with EU 10/0211. Together with our Product Safety Department, we gladly support our customers in certification matters. The combined application of our permanently hydrophilic finishes with the treatment products iSys AG or iSys ZNP can impart bacteriostatic and fungistatic properties to the nonwovens aside from hydrophilic properties.